Isidore Ducasse (1846–70) was a Uruguayan/French writer (who wrote under the pseudonym Comte de Lautréamont) who died of unknown causes at the age of 24, during the siege of Paris by Napoleon III. The Comte de Lautréamont left behind one major literary work entitled Les Chants de Maldoror, the first canto (of six) of which was self-published in 1868. The strange, dark, and incoherent work [partially readable in English translation here and fully readable in the original French here] has been described by the British novelist Richard Milward as being “like an old, twisted rulebook on how to break all literary rules”. Many years after it was published, it was discovered by the Surrealists and ardently adopted by them as a forerunner of the movement. The list of artists who produced works based on the book or its author reads like a ‘Who’s Who’ of Surrealism, including André Breton, Salvador Dalí, Max Ernst, René Magritte, André Masson, Joan Miró, and Yves Tanguy. The book famously includes a description of a boy as being “as beautiful as the random encounter between an umbrella and a sewing-machine upon a dissecting-table”, a line that was cited by André Breton and Max Ernst as an example of the chance juxtaposition that the Surrealists loved. 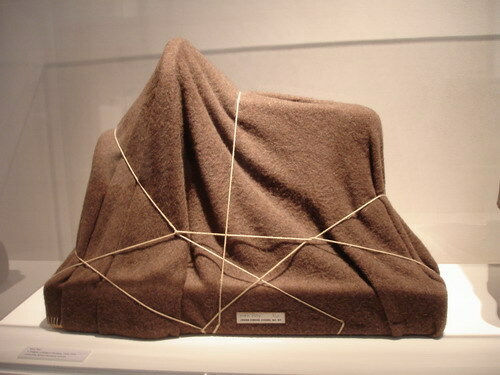 The same line inspired this (1920) Surrealist portrait of the Comte de Lautréamont by Man Ray, entitled L’Énigme d’Isidore Ducasse, now at the Tate Museum in London. Never assume that a thing is real just because you think you can see it.